(SPOILERS) Some would have you believe Dumbo’s less than astonishing opening weekend takings were down to an IP that held no cachet for today’s generation, the kind of argument trotted out when it’s convenient but is also used to contrasting effect when it suits (“They smartly managed to freshen the age-old brand up for a modern audience”). That, and a side order of “Sadness, animal cruelty, loss of parents. Who wants to line up for that?” Answer: plenty, it’s all in the telling. Rather than reaching such rash conclusions, I suspect the reason Dumbo has gone down like a lead elephant is that it managed to trample on everything that made the original so beloved. In retrospect, perhaps you could hardly have expected otherwise, given the collaboration of the successful writer of the Transformers franchise and a director who has (mostly) long since sold his soul into creative limbo. Dumbo’s a lame duck principally because it’s barely even about its title character. Sure, the whimsical wee elephant’s central to everyone’s attentions or ambitions, but more in the manner of a monster movie, where the creature comes on periodically to make an impact (except Dumbo’s impact is negligible), and then withdraws. He isn’t central to his own movie. I’m guessing the half-measures anthropomorphising here is based on Dumbo not speaking in the original, so the assumption was that it wouldn’t make a marked difference if you dropped the mouse, the crows etc. Except that they’re the whole essence of our “in” to Dumbo and lifting him out of the state of being a sad baby elephant (they’re the fun quotient, basically). A couple of cute kids just don’t cut it, particularly when the plot shifts to focus on their protecting Dumbo rather than Dumbo’s quest itself. He becomes little more than a very cute CGI prop, to be pushed and prodded into place at the appropriate moment, rather than a protagonist to shed gallons of tears over. The pain of the loss of his mother and of the abuse (from his peers in the original, now from a mocking audience) is defused and rendered largely unaffecting (for fear of causing too much trauma?) The most imaginative sequence, meanwhile, is a direct lift from the original, minus alcohol (pink elephants) and thus entirely unmotivated (it’s like the CGI-action Jungle Book shoehorning in the animated version’s tunes). Where the original story was almost entirely from Dumbo’s (and Timothy Mouse’s) perspective, here it’s largely from that of the humans. Yes, it’s preferable not to make slavish reproductions of the originals (j’accuse Beauty and the Beast) but to successfully evoke the original andbe original, you need to recognise its essence, which Ehren Kruger and Tim Burton singularly fail to do. Indeed, the shift in focus of the plot is far more likely to have been motivated by the conundrum of how to doubling the tale’s length than a desire to explore Dumbo’s world in greater depth. Thus, the fate of Danny DeVito’s Medici Brothers’ Circus takes precedence, with Max (DeVito) doing a deal with Michael Keaton’s VA Vandevere, owner of Dreamland amusement park; it’s a rather worn and unengaging plotline that fails to engineer anything new, despite the reliable players at its centre (it has been suggested this is a commentary on Disney buying Fox, but that would make Murdoch the little guy, which would be ludicrous). Perhaps the only surprise is that Vandevere’s financier, played by Alan Arkin, is sympathetic, at least in comparison to Vandevere himself. It’s potentially an intriguing move to put “the villain” in turn under pressure, the success of his big enterprise in no way guaranteed, but nothing substantive is done with the idea. As noted, instead of a mouse, Dumbo’s welfare is looked out for by one-armed Colin Farrell’s kids (Nico Parker – daughter of Thandie Newton, and on this evidence a chip off the old block who may even surpass her mum one day, just as long as she never gets it into her head to play Condoleezza Rice – and Finley Hobbins). This trio have their own traumas to deal with, but like everything else, there’s no relatable depth or drama infused into a family dealing with loss in the aftermath of war and disease; their situation is perfunctorily established, with no ensuing substance. The performances are all decent – Farrell the honourable, dependable dad, De Vito the lively small-timer, Keaton the Machiavellian toupeed monster, Burton’s current muse Eva Green the vivacious trapeze artist (maybe we should read Burton as Vandevere, the empty, plastic showman who has lost sight of Max’s rowdy, relatable entertainer impulse) – but to negligible end, because the movie itself is bereft. 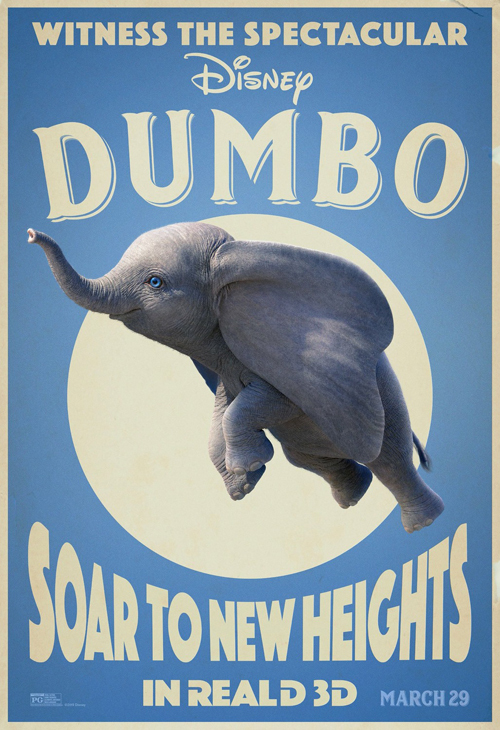 Dumbo is a visually dour, sluggish (nearly two hours), humourless film (almost wholly absent of the wit and weirdness that were once Burton trademarks). If it occasionally soars, it’s only thanks to Danny Elfman’s trademark ethereal accompaniment (that Edward Scissorhands one, reduxed). One might have expected Burton to extract some amusement from the circus trappings, but his energy seems to have been irretrievably diluted by a reliance on CGI that has become ever more consuming post-Charlie and the Chocolate Factory. At the conclusion, CGI Dumbo is returned to his CGI mother, both bound for India with kindly snake charmer Roshan Seth (Gandhi, Indiana Jones and the Temple of Doom), to join up with all the other CGI elephants in the wild, although it’s debatable how much better off they’ll be there. Tim Burton’s career lows have become increasingly common (however, to go against the throng, I wouldn’t include Planet of the Apes with them), notably his two biggest (unadjusted for inflation) hits Charlie and the Chocolate Factory and Alice in Wonderland, but even they had a personality of sorts, off-putting as that was. Dumbo is simply plain and indifferent, simultaneously sumptuous and forgettable, and a chore to sit through. As for Disney’s live-action remakes, in the space of six months they seem to have gone from banging out no-brainer hits regardless of quality to very tentative efforts. First The Nutcracker and the Four Realms (perhaps not officiallyone of their number, but symbolically so) and now this. And if The Lion King is surely a slam dunk, Aladdin is looking rather iffy. Frankly, though, if their approach is to churn ‘em out with the reckless abandon of an ‘80s horror franchise milking the goods for all their worth before the well dries up, they’ve no one but themselves to blame when they make an unholy mess.